Shed the winter boots and don the running shoes and hiking gear. It is time to get outside and get active. I for one am so happy to finally be able to see the grass and enjoy those leisurely walks in the woods with Dunkun and Alena. Exercise throughout the winter has ensured that Dunkun and Alena are fit to run free and enjoy the outdoors without concern of injury due to muscles and ligament weakness that can occur during hibernation. If you have not been active throughout the winter, be sure to take it easy and work up the length and intensity of your exercise. This will help to build strength and reduce trauma to muscles and joints. For those of you who suffer from environmental allergies, now is the time to start omega fatty acids and antihistamines, which can help to reduce allergy symptoms. If immunotherapy, available in oral and injectible form, is something that you are interested in, you should talk with your veterinarian about performing the required blood tests along with your heartworm and tick disease blood test. Parasite prevention is a must during the warmer months. With the increase number of ticks moving from the east, west and south, we need to assess the risk factors in contracting tick borne diseases like Lyme disease which can be contracted by humans. Infected ticks can transmit lyme disease, erhlichiosis, and anaplasmosis to dogs. All three parasites cause similar disease complexes including fever, lethargy, blood disorders and joint problems. All three parasites are treated the same and can be treated if detected. However, prevention is key and simple. Prevention of ticks should be started when the ticks are ready to attack, and this is any time the temperature is above 4 degrees Celsius …so now is the time to treat if your pet is at risk. For those of you who do not like to use medications, you should be checking your dog every time you have been in the long grasses or wooded areas; brush down the fur and even give a bath to naturally removed unattached ticks. It generally takes a tick 12-24 hours to move along the body and find a vascular area to feed upon. Ticks will generally move towards the head, neck, lightly furred regions and between the toes. 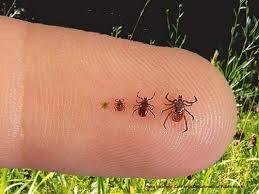 Several products are available to help control ticks and thereby help prevent disease induced by tick bourn parasites. However, there is no single product that has a label claim to prevent lyme disease which is transmitted by a specific tick called the deer tick. Bravecto, a chewable tablet is labelled to kill the deer tick within 12 hours of a blood meal, which is before the time it takes the deer tick to transmit lyme disease. Bravecto continues to kill ticks, and adult fleas, for 12 weeks. Bravecto does not treat or prevent heartworm disease. For more information about Bravecto visit http://www.bravecto.ca/en/. Let’s not forget about heartworm disease which is transmitted by mosquitoes. In Ontario, heartworm prevention starts in June and ends in November. The timing of heartworm prevention is very important because all heartworm prevention products work backwards to kill the immature stages of the heartworm which are circulating in the dogs blood. Do not forget to give the November dose of your heartworm prevention and do not worry about starting, Revolution or Heartgard to name a couple, when you first see mosquitoes. Annual or biannual blood work to test for heartworm status is important because the prevention products are not 100% effective and they do not kill adult heartworms. 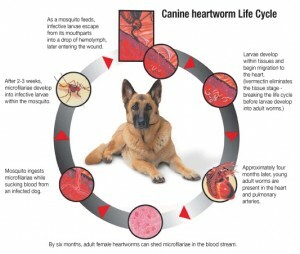 Dogs that contract adult heartworm require specific treatment and veterinary care. The blood test should be performed 6 months after the last date of possible heartworm infection, which is November in Ontario, because it takes 6 months for the immature heartworm to become an adult and produce the antigen that is detected in the heartworm blood test. Be sure to make your veterinarian aware of any warm climate travel outside of Ontario during the winter months because this can affect your dog’s possible heartworm exposure. Be sure to discuss all of your pet’s health care needs and concerns with your veterinarian. Visit http://www.dogsandticks.com/ to get more information about parasites and assess your dogs tick risk. Now turn off the computer, get on those sneakers, grab the leash and enjoy the beautiful outdoors.